Henry Freerking passed away at 9 p.m., Monday, Sept. 18, at his residence here. Mr. Freerking suffered a stroke at about 11 a.m., the same day, from which he never recovered. He attained the age of fifty-six years. Those of the immediate family who mourn his passing, are: his wife, a daughter, Dorothy, and two sons, William and Herman. Funeral services will be conducted by Rev. G. Horst at the Hack Funeral Home, this afternoon, (Thursday), at 1:30 o’clock. Interment will be in the Beecher Mausoleum. 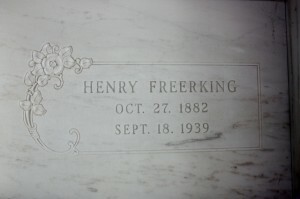 The departed, Mr. Henry Freerking, son of Henry and Louise, nee Scheer, Freerking, was born, October 27, 1882, near Beecher. The child of Christian parents, he was soon after birth baptized and later, following a course of religious instruction, confirmed by Rev. G. Koch in St. John’s Church, April 11, 1897. 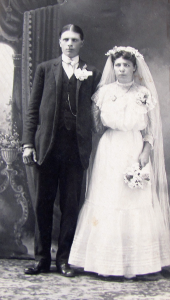 On Sept. 1, 1907, he was married to Miss Minnie Seitz. The ceremony taking place in Zion’s Lutheran Church at Beecher, Rev. L. Going officiating. This union was blessed with five children, of whom two preceded the father in death. The surviving children, who together with the wife, mourn the departure of a true loving husband and father are: William, Herman and Dorothy, all in Beecher. Immediately after marriage, the young couple took up farming, at first southwest and later southeast of this village. After following this enterprise for about eleven years, the family came to Beecher and made their home on the northwest corner of Indiana and Dunbar streets. 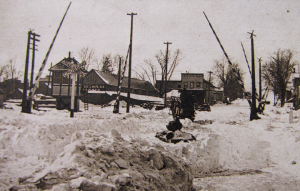 Henry manually operated the crossing gates at the Beecher Depot gate house. This is a photo taken after a snowstorm. Being employed for many years by the C. & E. I.R.R. Co., as a section hand and signal man, the departed in late years was forced by illness to lead a more or less retired life. Following two light attacks of apoplexy during the early part of this year, from which he so far recovered that he could be up and about, he suffered another, Monday, Sept. 18, which excluded all hope of recovery. Although everything possible was done to make him comfortable, the end of his life came peacefully on that same day at 9 p.m., at the age of 56 years, 10 months and 21 days. He leaves to mourn, his wife; the children already mentioned; one sister, Louise, Mrs. Aug. Wehrmann, Beecher; two brothers, William, south of Beecher, and Herman, near the state line; and a host of other relatives and friends. Funeral services were conducted, Thursday, Sept. 27, from the Hack Funeral Home, at 1:30 p.m., where Rev. G. Horst spoke fittingly in both the English and German languages. A quartet, composed of members of St. Luke’s Choir, rendered two appropriate songs, Mrs. Frank Hunte accompanying them on the piano. A number of floral pieces gave evidence of the esteem in which the deceased was held by those who really knew him. He found his last resting place in the Beecher Mausoleum. The departed, a true loving husband, father, brother and friend, went true to his real inner better self as in later years has convinced all who knew him that natural weaknesses and inclinations can be fought and overcome with the help of Christian training, faith, hope, love and determination. Thus, during his late years, with the approaching eventide of his life, he stood as one who merited the respect and esteem of all of us who are struggling along on the path to eternal life. Thus, we may say farewell to him in the hope and assurance that the setting of his life’s sun here on earth presages a glorious dawn in the hereafter. This entry was posted in Automated Burial Listing, Burial Listing, Burial Location, HEADSTONE, Obituaries- Have Full Copy, St. John Evangelical Lutheran Church - Eagle Lake, Zion Ev. Lutheran Church, Beecher by Sandra. Bookmark the permalink.